From left to right, the three stones read “We remember all those who played a part in our struggle locally. No part was too great, and none was too small. ‘Our revenge will be the laughter of our children.’ Bobby Sands”, “In proud and loving memory of our dear friends and comrades Vol Sean Dolan, died Oct 1941; Vol Joe McGinley, died Aug 1943; Vol Jim O’Hagan, died 19th Aug 1971; Vol Kieran Fleming, died 2nd Dec 1984; Vol Danny Doherty, died 6th Dec 1984; Vol Gerard Logue, died 22nd Mar 1987. I measc laochra na nGael go raibh siad.”, “‘Life springs from death and from the graves of patriot men and women spring living nations’ Patrick Pearse.” This IRA memorial garden is between Rose and Mimosa courts, off Trench Road, Derry. For the 25th anniversary of the 1981 hunger strike [stailc ocrais], a prisoner reaches for a lark (the spirit of freedom) bathed in sunbeams like a beatific vision. “Go dtreoraí cuimhne bhur níobairtí agus íobairtí denár dtírghráthóirí náisiún beo bocht chun bua.” [“May the memory of your sacrifices and the sacrifices of our patriots guide a desperate nation to victory.”] The sentence is attributed to Bobby Sands but the source is unknown – please get in touch if you can place it. Andersonstown Road, Belfast. “I await the lark, for spring is all but upon us – Bobby Sands”. “This mural is dedicated in memory of the hunger H-Block martyrs. Unveiled by Mrs Fox, 4th March 2001.” Iveagh Street, Belfast. Three generations of republicans, from the Troubles, the Rising, and the Rebellion, salute “F[rankie] Ryan, B[obby] Sands, J[ohn] Rooney, G[erard] Fennel, B[artholomew] Teeling”. The first four are modern IRA volunteers; the last is a United Irishman from Lisburn (Rebel Breeze has a full account of his deeds). For an unspoiled view, see J0194. 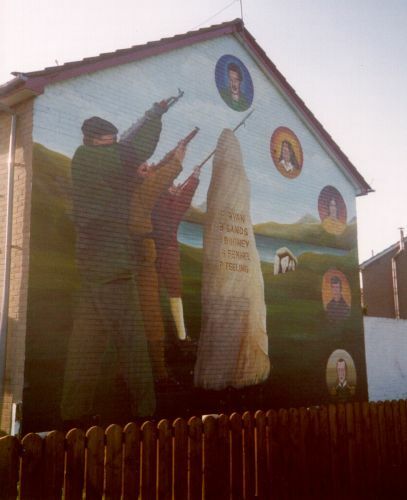 “Remember the hunger strikers, 25th anniversary.” Michael Gaughan and Frank Stagg, who died on hunger strikes in 1974 and 1976 and included in a line of portraits alongside nine of the deceased 1981 hunger strikers; Bobby Sands is shown in the large mural on the right hand side, next to blanket men Hugh Rooney and Freddie Toal.